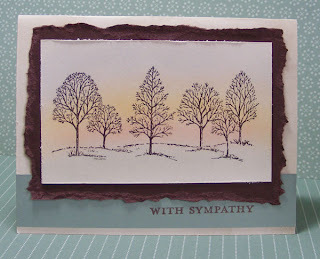 Trees from "Lovely as a Tree" are stamped here in Chocolate Chip Craft ink and then embossed. I used the Stampin' Pastels to create the subtle sunset and the grass. This simple card was completed with a torn piece of Chocolate Chip cardstock and a strip of Mellow Moss stamped with a message from the Kindred Spirits set. An easy and elegant card. All the materials are Stampin' Up!